The Centre for International Cooperation of VU Amsterdam (CIS-VU) has been awarded a grant worth €1.8 mln. 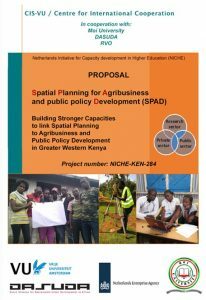 to implement a project on Spatial Planning for Agribusiness and Public Policy Development in Kenya. The grant is part of the Netherlands Initiative for Capacity development in Higher Education (NICHE), a Netherlands-funded development cooperation programme. The main beneficiaries of this project will be the staff and students of the School of Planning and Architecture at Maseno University (MU-SPA). In addition to the provision of 6 PhDs and 8 Masters, the project will contribute to curriculum development, interdisciplinary research, and tailor-made training and counselling services in the field of spatial planning for agribusiness and policy development. The contributions will be a joint effort of Dutch and Kenyan partners from scientific, business and governmental institutes. SPINlab will participate in this project to teach on GIS, spatial analysis for policy support and geo-ICT tools for participatory planning. We will furthermore help establish a geo-data portal for research and planning purposes. For more information about the SPINlab’s role in this project, please contact Dr. Eric Koomen (e.koomen@vu.nl).